I told myself it was much too early to write any opinionated piece on the umbrella rig. After all, I just began this column 3 short weeks ago. But after a quick review of bass fishing�s morning news, displaying a prominent photo of the latest multi-lure setup complete with ten swimbaits attached, I had to jump in. Now my goal is not to attempt to sway any of you in the debate over multi-lure rigs in tournament fishing. I, just like many of you, am simply a fan wanting to learn how the best in the world catch bass. Rest assured, if I were competing on the FLW Tour right now, I too would be slinging the monster � you can only take money out of my pocket for so long. But I wanted to give you an opinion, based on how I felt the technique was influencing the sport of tournament bass fishing, as well as give you a little insight as to what�s really going on in the bass world. Concerning the U-rig, I�ve interviewed several prominent FLW Tour pros (who were adamant on remaining anonymous) and previously spoke to a Bassmaster Elite Series angler to get his viewpoint. First we need to look back a little to the history of tournament bass fishing. Back in the early days, most people fished for food, kept what they caught and fished with live bait. From what I can tell, Ray Scott helped get the ball rolling on tournament fishing because his circle of buddies thought it was a good sport and one that would catch on throughout the South. Now nothing livens up a good sport like throwing a few bucks in the hat to see who�s the best at it; thus, tournament fishing was born. In order to keep things equal, rules had to be established, and those rules were based on what anglers at the time considered fair and equal to all fishermen and ethical to the fish. Immediately live bait was thrown out of the mix; real bass fishermen scoffed at bait. Trolling was also dismissed, and I feel this is where the umbrella rig draws a similarity. In the early days, trolling was immediately recognized as a way to catch bass above and beyond any method used by cast-and-retrieve fishermen. Ever see a video of Buck Perry spoon-plugging back in the �50s? Yeah, I�m guessing the tournament committees of the time did as well, and they didn�t want anything to do with that. Tournament fishing as a sport was immediately defined as an angler casting a lure to catch a bass. I�m really surprised that the rule mentions having �a lure� attached to a line as the definition of fishing. Now, I know it�s been said time and time again, but an umbrella rig is far from a lure. You'd think they would have changed that by now. In any case, the history of the sport set tournament anglers aside from the recreational crowd by establishing rules that led to a fair chase of the fish, and made the pursuit and catching of the fish more than just luck. It�s vitally important to realize that tournaments intentionally handicap participants already by disallowing other forms of fishing viewed as overly effective. Well, the umbrella rig is no different. What�s being created is a situation where the guy with the most lures has a better chance of winning. Ever wonder why the tournament trails settled on 8 feet for maximum rod lengths? Because, in the early days of flipping, the guys with the longest poles won. Guys were dipping into the brush with 14-foot rods � the tournament trails finally said enough is enough because they recognized that this equipment revision and modification needed to have some sort of a limit. It�s no different here. 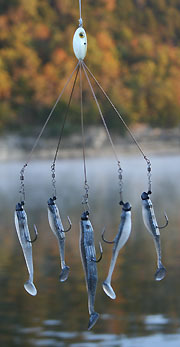 In the short history of umbrella rigs, we have already seen the technique go from five lures to (believe it or not) up to 13 lures at Beaver Lake, sources tell me. Why should we only use one rod at a time, as our rule example states? Ask yourself this: Who has more of an advantage, a guy with two rods or a guy with 13 lures? In addition to this, the remaining swinging lures oftentimes snag bass caught on the rig. Granted, jerkbait and crankbait fish have been coming to the boat �foul hooked� for years, but is that the product the tournament trails want conveyed? Is that what they want the occasional fan of fishing to see when he flips on the TV on Sunday � some guy with logos all over his jersey, reeling in a monster umbrella harness, swinging bass over the side that are hooked in the body? How do you think that looks to a guy who just fishes occasionally and does so for the relaxing, wholesome value it offers? I think it�s obvious now, after the latest event at Beaver, that all tournament trails will need to make a ruling on the number of lures that are allowed in competition. Tour anglers are fierce competitors, rightfully so, and catching bass determines how well their tax forms look in April. I don�t blame them. But we will see 10, 13, even 25 lures in short order if something isn�t done. Mark my word: this is just the beginning. Unfortunately, I think what will come about will be a ruling of one umbrella rig allowed in competition, meaning competitors can continue to use 5 or more lures where legal. This will look like a compromise between the anglers and tournament organizers, but will defeat the purpose of those attempting to bring tournament fishing back to one rod, one lure, cast and retrieve. Fans may briefly be led to believe that allowing the use of the rig is about bringing exposure to lure manufacturers and creating more revenue in the tackle business, but I doubt that. Tournament trails have been looking outside the fishing business for quite some time for sponsorships, and giving exposure to those brands, more so than tackle brands, for years. Yeah, it can�t hurt, but tackle companies will just make more swimbaits, ChatterBaits, or whatever the next craze is. The pro bass tournament industry never concerned itself with selling live-bait containers, or downriggers and planer boards for trolling, did they? Regardless of whether umbrella rigs are allowed, Tour pros will win tournaments on something and drive tackle sales forever. Pro bass tournaments drive sales and behaviors across the fishing market, more so than any one source. However, after speaking with the touring pros I interviewed, I have to say that it�s as if the sport of tournament fishing is going about business with a giant asterisk over its head. One competitor compared the technique to a cast net. I can�t help but think that the Elite Series, without the rig, seems to be getting along just fine. My interviewee on that side was ecstatic that it wasn�t entering their arena. As a matter of fact, I think we�ll see more than a few FLW pros looking to jump ship just for this specific reason. I just don�t see why we need to adapt tournaments to the invention of a new way to capture the fish. What if I come up with an appealing scented bait that I put on a string, tie to a buoy, and then throw my buoys all over the lake, would that be fishing? Sure � commercially.